Ecomondo attracts over 116,000 visitors and 1,200 exhibitors each year. 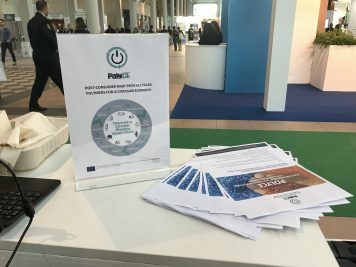 This year, the trade fair provided the opportunity for 40 European-founded projects to communicate research objectives and results to a broad and heterogeneous audience, and to show how EU-funding helps the circular economy become a reality. Attending Ecomondo helped create collaborations and dialogue with other EU projects that are committed to research activities in different fields of sustainability, such as energy efficiency, sustainability design, and recovery of valuable raw materials from waste and innovative circular plastics solutions. Participants were very interested in the innovations displayed at the EASME exhibit during the three days of the fair. An entire expo area was dedicated to the theme Waste and Resources, addressing diverse and relevant topics such as valorisation and services for integrated waste management, technology and machinery for waste processing, ecodesign and new materials, and repair and refurbishment services. A complete list of the EU projects represented at the Ecomondo fair can be found here. All of the projects are managed by the European Commission’s Executive Agency for Small and Medium-sized Enterprises (EASME) and receive funding from one of the programmes that EASME implements on behalf of the European Commission. The PolyCE team is very grateful to have been part of such an inspiring event.